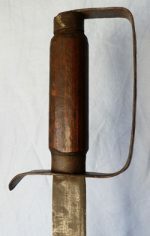 An Original Finnish Model 1927 Rifle Bayonet. An original Finnish Model 1927 Rifle Bayonet. Maker stamped to blade forte. No scabbard. Blade length is 12 inches (16.5 inches overall). No scabbard.